This series of video lessons come from our sponsors at Learn and Master. They provide excellent training material for adults to learn different musical and artistic skills. In this lesson we get to learn how to read rhythms in written music, but first we finish putting together the Lean On Me that we started in the previous video. Now we're going to learn about chord inversions. This involves playing a triad with a different note at the bottom. For example, the C major triad usually has the C at the bottom, E and then G. When we play it as E, G, C this is the 1st inversion. G, C, E is the 2nd inversion. This lesson introduces us to the concept of triads within a key. Here we see that the triads based on notes contained within the key are numbered and have a distinct relationship. Welcome to the Beginners Piano course. 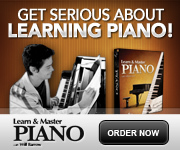 This course is intended as an introduction to playing the piano and will collect lessons from many different sources. The intention of this course is to allow you to get familiar with the keyboard and learn about scales, chords and chord progressions. You will also learn some basics about reading sheet music. This course is not static and it will grow over time as lessons are added and updated, so make sure you check back regularly for more information.